Just thought you might like to see my latest scratch built project, built from a small plan downloaded from the internet. 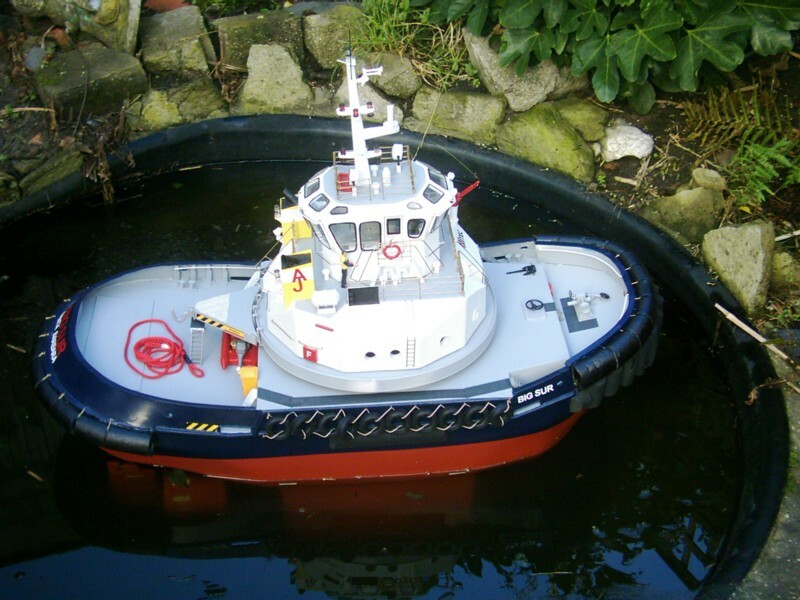 Nova Tug want this model at the International towage and salvage convention in Rotterdam this year so I must have got something right! Martin: "Great working hook system, how does it work?" Andy: Believe it or not Martin ,good old curtain track/hooks. I am at the moment online to inventors of this beast, looks like I have an invite to Holland end of April expenses paid wooooooooohoooooo. 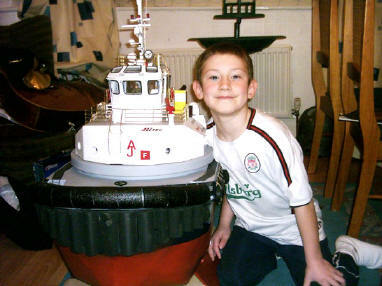 I started tug building about 25 years ago with kits , teething on Billings Bankert, and ending on Robbe's Happy Hunter.I decided I wanted to build my own stuff and using what I had learned from kit building put it to use scratch building. I like the modern stuff, the more weird the better. Surfing the net one evening I came across Novatug one of the sponsors of "Tugspotters", and saw their Carousel design, I found it interesting and downloaded a G/A that was on the site at the time, filing this away in the " must do that sometime dept.". My friend , Brian Grunes wanted to build a balanced pair of Tugs with me ,pushed me into getting this design into operation. I started by getting the plans into a workable size ie, about 41 inches in length and 19.5 inches beam ,this gave a scale of 1/24th. I then drew some lines from the G/A and drew a 3d view. In the mean time I e-mailed Novatug but got absolutely no response. So, that was a challenge, I was going to build this boat in spite not because of them. I started by getting some Blue builders foam and carving a plug from this and my friend Brian got a mould from it and made a couple of fibreglass hulls from this.He was then able to make the complete deck in fibreglass and this "snapped" on to the hull rather like "Tupperware". I decided early on that I was going to use 5 bladed 10 cm props keeping to the scale, and used "polypipe" ( plastic pluming ) couplings for fixed nozzles. the Becker rudders were made by another friend of mine from Crosby Model Boat Club , near Liverpool, MNalcolm Wicherley. The motors are from Mobile Marine Models, another Brian who had the biggest fan motors I've seen in my life! I used 6inch prop shafts at M5 and two Mobile Marine safety couplings. Speed controllers are two Hitec heavy duty things ,made for racing cars, and the radio system is a 4 channel Futaba sky-sport. The finished moulding including marine ply bilge keels, covered with fibreglass resin. The superstructure was made from the spare ply from an old magazine rack and the fittings were either scratch built or bought in from many trade stands at the Blackpool show in 2005. First day came for a test sail...........oh boy was that fun! She took in excess of 24Kg of batteries to just approach the waterline! Luckily I have a stock of very large 12 volt batteries in stock used for my other manic projects. I went tenderly slow ahead........."Jeeze this was brown trouser stuff......!" The monster turns on a sixpence, has a static bollard pull in excess of 5KG and can really push water full ahead. I took some pictures and after some "Dutch courage", e-mailed Novatug once again, saying that this is how you're Tug will luck when you build it, because I am a cheeky sod! Guess what? A response! 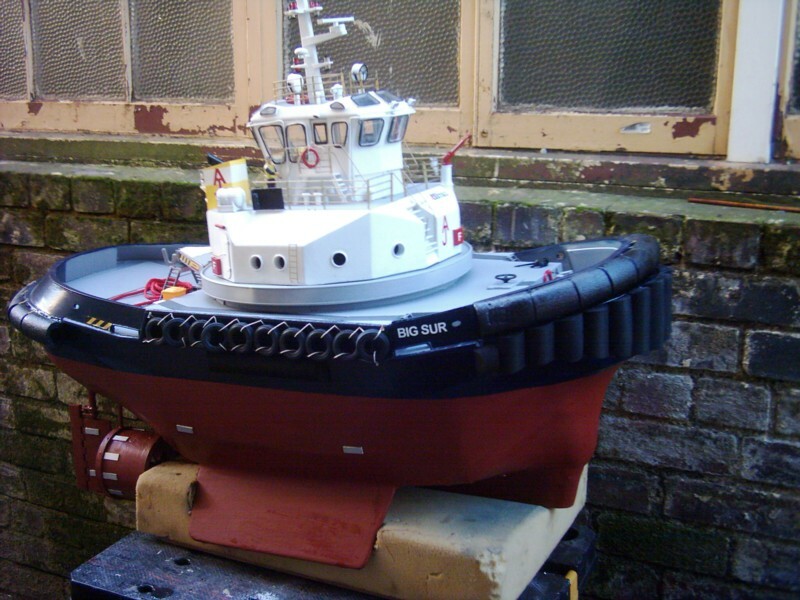 From no other than their general manager, saying that this was the first model in the world to their design and errrrr, can they borrow it for the International Towage and Salvage convention in Rotterdam at the end of April! So having taken a nanosecond to say yes, it looks like a freebie trip to Rotterdam for me and my model tug this year.